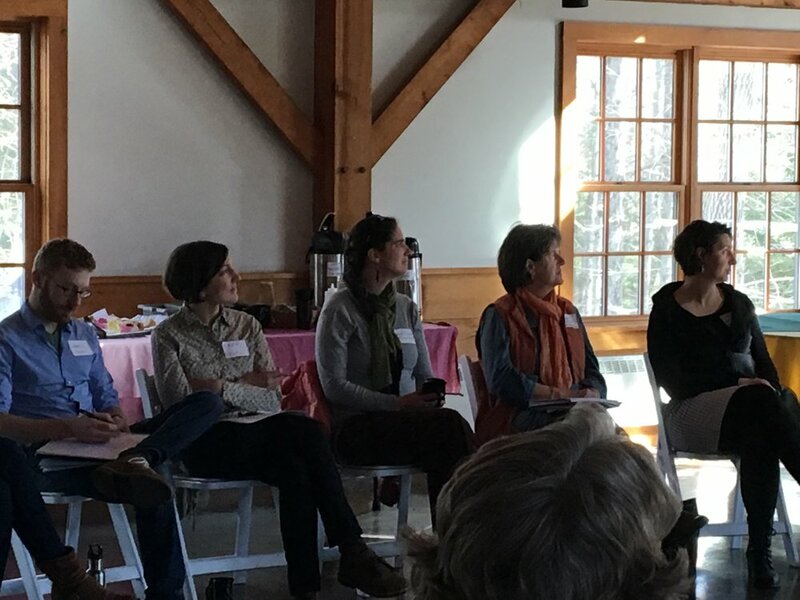 Thanks to a HNH Foundation You Have Our Trust grant, over 30 local food stakeholders convened at Stonewall Farm to participate in round table breakout discussions to identify two priority actions/initiatives to meet current farm infrastructure needs. Priority items will be taken to the Infrastructure Working Group to implement over the next 18 months. Stakeholders prepared for the event by familiarizing with "Monadnock Local Food Infrastructure Assessment" drafted for the event by Sarah Harpster and Daniel Prial. Dave Chase, moderator, orchestrated successful outcomes for the event by providing ample time for brainstorming and distillation of information. Many ideas, important feedback, collective processing of information resulted in 2-3 top network priorities. These include the need for: light processing/short-term storage, stronger data sharing/network, and better utilization of present assets. Priority items will be taken into monthly Infrastructure Working Group (IWG) meetings for implementation steps over the next 18 months. More conversation and idea-swapping was exchanged over a delicious lunch prepared by The Community Kitchen catering. For further information, updates or to join the IWG, visit the Infrastructure Working Group page. Thank you to Julie Davenson of Stonewall Farm for her support with this event! 43 Monadnock Farmers and their families enjoyed a night out to reconnect with other farmers, attend workshops, and to talk about the weather at Alyson's Orchard on a snowy evening in March. Thirty-three Monadnock farmers and their families joined us for a fun, informative evening at Alyson's Orchard. The gathering provided space to reconnect, swap challenges, ideas and resources and to speak one-to-one with farm service providers. Over 30 farmers, restaurant owners, and interested citizens participated in three workshops covering funding/financing, acquiring land to farm, improving farm productivity and equipment, successfully selling wholesale, and NRCS financial and technical programs to improve production.